The ceiling is embellished with a ribbon of stucco-type flowers and leaves in white on a pale green background, with white lacy “chhatris” (lights or air vents?) hanging from it. Beneath that the wall joins the ceiling with a band containing bas-relief traditional Indian musicians and dancers; and below this is a busy and colorful painted mural with scenes resembling old Mughal miniture paintings of people going about daily life and playing dandiya too. Finally, stuccoed white peacocks against the same pale green background decorate the lower half at eye level. 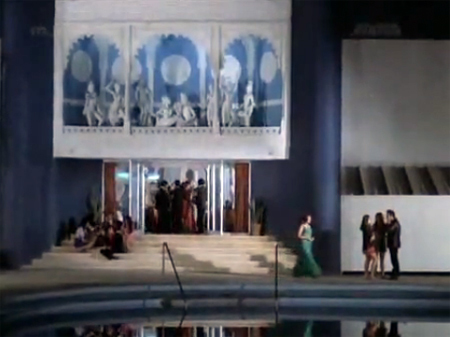 Large statues of deities and dancing girls are plonked down in pillars throughout the room; and as I discovered during 36 Ghante (1974), french doors—which are usually curtained off with green stripey drapes—lead out to an outdoor swimming pool with a large patio. The poolside decor is pretty distinctive in itself, so I would imagine someone who lived in 1970s Bombay might be able to identify it by that alone! It’s possible that the poolside scene is shot someplace different from The Room, but I don’t think so because the transition between inside and outside in the film is pretty detailed and smooth. Plus the…”thing” above the doors leading inside matches the interior decoration very well even if it looks poised to fall and crush someone below. 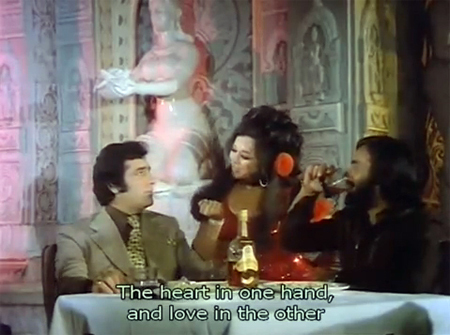 Padma Khanna too, with Rajesh Khanna on drums, in Chhaila Babu (1977). One of the very best things about this place is that no matter whom you put in it or what they show up wearing, it holds its own in the attention-getting department! Even Rekha (1977’s Kachcha Chor) with her gold lamé and orange silk and brightly dressed backup musicians don’t overwhelm The Room’s awesome personality. Plus, how clever is that carpet? You could spill just about anything on it, and never know. 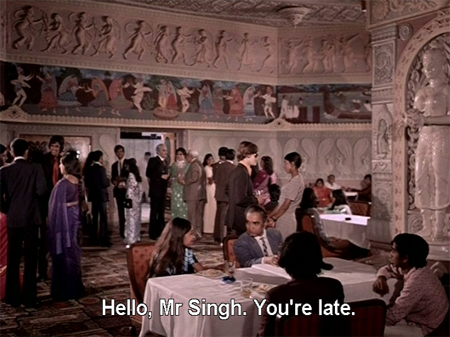 The Room is used also in Kashmakash (1973), Hawas (1974), Madhosh (1974), and I am sure countless others. 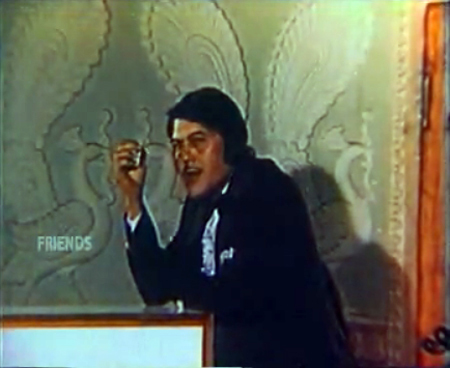 Manmohan hangs by the peacocks in the film Jalan (1978). I’d really love to know the history of this place if anyone can share it with me, whether it is in fact a set or if it was part of a real building! In any case, I will continue to take as many detailed screenshots as I can of it so that someday I can reproduce it in my Fillum Ka Museum, when I build it. There are other such locations which require proper identification too, such as this swimming pool with its beautiful deco-y arch of a diving board (I love how Vinod’s posture perfectly matches it, and his tiny tight swim trunks have nothing to do with this picture being the one I chose for illustration). 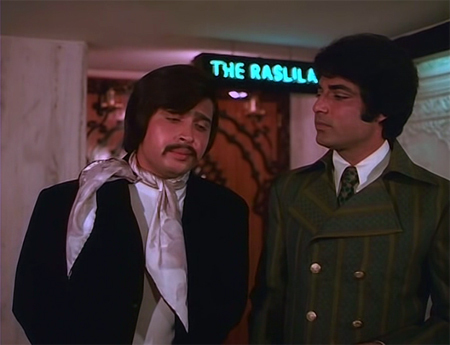 Thanks to the film Madhosh which was otherwise pretty execrable, I have identified The Room as definitely belonging to the Hotel Horizon (and the pool with it), and probably called “The Raslila”. First I saw the pool which is outside The Room in the opening credits, and then later there it was again in a scene, along with the entrance to the room—all matching up to what I had noticed during 36 Ghante. There were also two or three songs and other scenes INSIDE The Room, which is oh-so-familiar by now, but one of them ended with people going out into the building rather than the pool area. And to my joy, there was a neon sign there with a name! I was pretty sure that it was the actual door because the hallway decor was the same type, and the inside doors match the exterior one under the sign (same peacocks). So I was pretty happy with that discovery alone! Just as I was about to kill myself because I hated Madhosh so much, there was a New Year’s Eve party in The Room—and it went dark at midnight. I think people ten blocks away heard me scream. Posted on February 14, 2011 at 1:01 pm in Hindi film history, Hindi movies	| RSS feed You can skip to the end and leave a reply. It might be either one, but I want to know for SURE. I know I’ve seen the pool at Sun ‘N Sand in lots of films (it isn’t the pool I am looking for above I know) but can’t remember if it’s the same as the pool belonging to The Room. Hopefully somebody will know for sure, having been there or something! 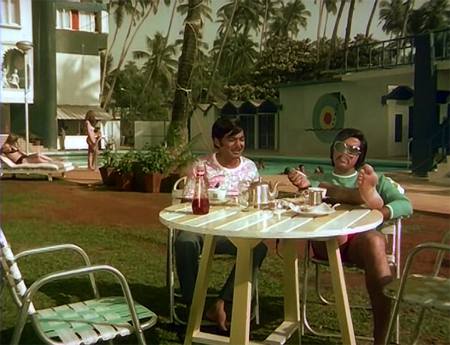 Here is the Sun n Sand pool, from Budtameez (1966). You have this also in Waqt (1965). It does not look like the one memsaab is looking for. I think I have confused the issue by including the pool shot at the end! I really want to know what the ROOM is. It doesn’t appear that the poolside at the Sun N Sand is the same as the one outside the room although it may have changed by the mid-70s. I have no idea what the Hotel Hilton pool looked like either, esp. in the mid-70s. The other pool with the arched diving board is incidental to this, if someone knows where it is then great, but I mostly right now only care about The Room. This is quite possibly the best Bollywood related post ever. I just love the attention to detail. Quite exquisite. Or mad. Maybe both. I know there is medication that could probably help me, but then I would just be bored. totally agree w bollyaddict. And stay off the meds, Memsaab…we love you exactly as you are! I was going to say Oberoi-Sheraton (now Trident ) Hotel. Opened with a bang in 1973. But no, that’s not ‘The Room’. I did come across the name Dale Keller (http://www.nealprincetrust.org/id166.html) the designer who added ‘detailing like a relief panel in Udaipur style, Tanjore pillars in the Indian restaurant and the like.’ to Taj Inter-Continental. And he also worked on Oberoi Hotel. 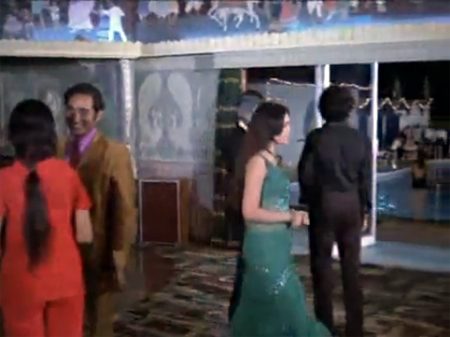 Also while looking for ‘The Room’ I came across Hotel Inphom featured in Gomti Ke Kinare (1972) for a ‘Disc’ scene. EXCELLENT WORK. Your museum colleague supports this effort fervently :D I hope some of your readers will show the older members of their families – they might be our best hope. And if they can find this one, maybe they can find The Bar – you know, the one with the blue mirrored designs of bottles and the eye! As I read down, I kept thinking “But what about The Carpet?! ?” This place must have made people instantly tipsy – it’s just so very very garish. Aren’t stage makeup and sets etc always gaudier in real life than they show up on film? Gah! LOL, if this was even gaudier in real life than it looks then maybe it’s best left un-found! You mean the “Pyar Karnewale” room? I would bet that is (was) a set…although I could of course be wrong. Have you seen it elsewhere? Oooho but we could reconstruct it at the haveli! FAB! It can not be the Oberoi Sheraton simply because they would never allow a film shoot. In 1973 there were only four or five big hotels in the city. We are also assuming the pool and the room are part of the same hotel. I’m not assuming anything, only making guesses :) It may not even be a hotel, but some sort of restaurant or club. Maybe it was not even in Bombay! I have no idea! It is so distinctive though, someone somewhere has to remember it. jjYour collection is superb.Every BOLLYWOOD LOVER of sevety,eighty want not only about the film, starcast,music but also every thing in a detail.It may be the hotel used,the pool, the park, the road even the dress used.I also want the other hidden parts of the 70,80’s film. Jiyo bollywood,JIYO MEMSAAB. Well, I was in the 70s in Bombay, but it doesn’t help much cause I was too small to go to such places and moreover my parents wouldn’t have been able to afford such things! But that is not the answer you are looking for, are you? Am really looking forward to the right answer! Not too sure but I know quite a few films were shot at Hotel Horizon during the 70s but impressed by your research that is quite a collection of The Room you have there. Looking for constants in these movies: 36 Ghante and Hawas were both filmed at Raj Kamal Studios. 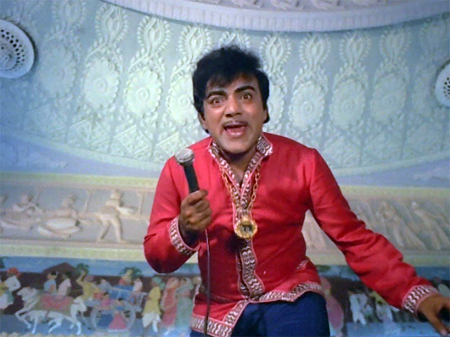 Chhailla Babu’s sound-recording was also done at Raj Kamal. 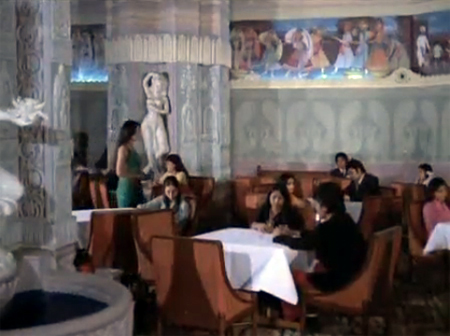 Hotel Natraj can be identified in the first few minutes of the film itself, there’s a Faryal item shot in the hotel. And that’s not in The Room. In fact ‘The Room’ does not feature in this film at all. Beth came across both the pool and The Room in 1981’s Krodhi, the latest sighting of it to date :) Don’t know if any hotels are mentioned specifically the credits for that. But I am pretty sure that the pool and the room are at the same place, wherever it is. As for Krodhi…well…it’s not THAT awful but it’s not really very good after the first 45 minutes either. It has a MESSAGE, you see, whereas I would rather have less message and more Dharmendra in green face paint! It goes a bit Guide in the second half. Snooze. It’s in the Chiru film ‘Rowdy Alludu’. 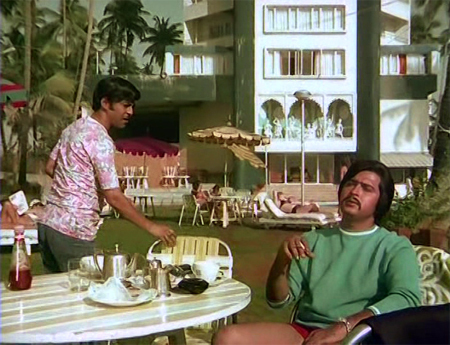 There is a scene in Mumbai where Johnny (Chiru) is celebrating his windfall and he and the boys go to The Pool. I’ve asked around but so far no luck with the Southern Film fans either. While in the university library today, I looked at some Fodor’s guides to India from the 70s. I’m in the process of narrowing down the choices for The Room from among the hotels with pools, but I also found this hilarious reference that makes me think that the Horizon might indeed be what we’re looking for: “the Horizon, with its hideous mock-Hindu decor…” EEEEEE! I think it’s a studio. The pool doesn’t seem to be really outdoors though the setting suggests so. I disagree…the transition from The Room to The Pool outside is pretty seamless in 36 Ghante, and the fact that they show up together elsewhere suggests that they do go together. If it were a set, too, I would think that we’d see different variations on the decor, but it never varies. Last night I read an article about V. Shantaram in an old magazine. It briefly mentioned his studio Rajkamal Kala Mandir and it Hindu design. That got my attention. So now I looked for films shot at this Studio. Dharmatama (1975) came up. 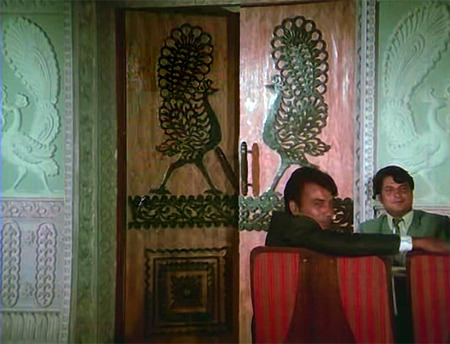 The ceiling of Premnath’s den seemed familiar…but the crazy cabaret number from this film had a familiar feel too but an Egyptian interior. So I don’t know. But I won’t be surprised if The Room turns out to be a room from Rajkamal Kala Mandir. That would make sense even with the pool if Shantaram also lived there. That Egyptian room shows up a lot in movies too!!! so that is useful info for it too :) Thanks Vinayak. I think Vinayak is right. WOOOHOOO! So “hideous mock-Hindu decor…” turned out to be RIGHT ON! :D NOW: let us go there immediately! We’ll be sadly disappointed probably, but YES! Hideous mock-Hindu decor it is!!!! Love, love, love. The pool outside too. Congrats!!! Yet another Bollywood mystery solved! First Nazir Kashmiri, then the famous gora guy (Gautam? ), now “The Room”! So what’s our next Bollywood mystery to be solved? Did we get the identity of that henchman? I think there was a suggestion that his name is Muhammad Ali (I’ve seen that name as fight composer in many movies) but is it nailed? There are always identities and locations to be discovered! I personally really really want to find out who the actor who played Ranvir Singh in Aaj Aur Kal is. I’ve seen him a lot and he is very handsome. Cheers! Good job on identifying the room! I want to go there now because it looks so cool. You guys now have a firsthand eyewitness – ME. Yes, this is indeed Hotel Horizon. Been there a number of times for dinner. There used to be a small dance floor in the center and a two feet high wall used to be there around the periphery of the dance floor at some sections. I am now 59 yrs old and this seems like yesterday to me. Wish I had seen the post back then, I would have promptly replied. That concentric circle painting/mural evokes childhood memories of visiting the place a couple of times and being taken in my the pool side every single time.The pool of the hotel seemed unique back then because it was the only non-rectangular pool I had ever seen. It was in the shape of the figure eight outline (or san pads without wings). It was a popular place for events back in the day, like weddings etcetera. 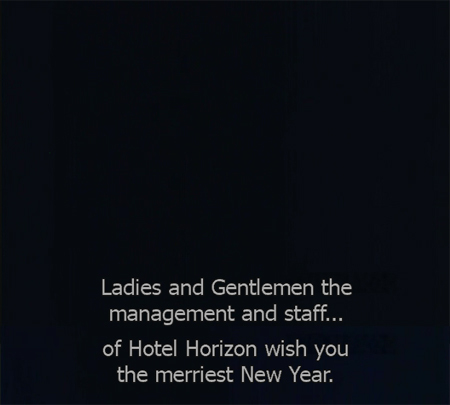 Incidentally, i was checking if Hotel Horizon is still non-operational and chanced upon your page. I stood behind the fence last September that surrounds it and sadly noted that it is being torn down and is in ruins :( How lovely that you remember going there! I am envious. Thanks for sharing!